Last week I decided it was time for a change! In the past I've always had the mentality that "hair grows" and have never been afraid to chop it off. I loved going in every few months with a new photo of whatever Victoria Beckham's bob looked like or Katy Perry's bangs. In 2012 I got the itch to change it up even more. 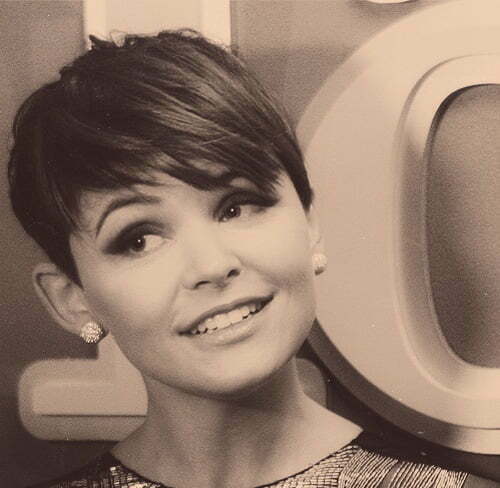 I was dying over Ginnifer Goodwin's pixie cut & couldn't get over how chic and Audrey Hepburn-like it was. I took the plunge and off went my hair. I loved it in the beginning but shortly I began feeling like a boy. It's also a ton of maintenance; it gets a little long and hello mullet! In the spring of 2012 I decided it needed to be grown out. I went through some reeeaal interesting hairstyles and declared I wasn't cutting it anymore once I reached a point where it was somewhat even. I stuck to that decision for quite some time until recently. I was so tired of my hair and it also desperately needed the love of a hair stylist to get rid of dead ends and all. So to the salon I went! My usual stylist in Richmond [yes I'm that particular about my hair I will go 2 hours south for a cut!] is on maternity leave sadly; so I branched out and tried a DC salon. I saw Krystal at PR at Partner's and couldn't be happier. I took in reference pictures of Alexa Chung and a few other Pinterest images. That day Krystal gave me a super sleek blowout that was the best I've had; but I love wearing it a little bed-head like and my bangs a little messy as well [see HERE] much in the fashion of Alexa. ps : I just tried to comment on your post but I had an issue with the program that runs the comments :( i'll have to try again later!